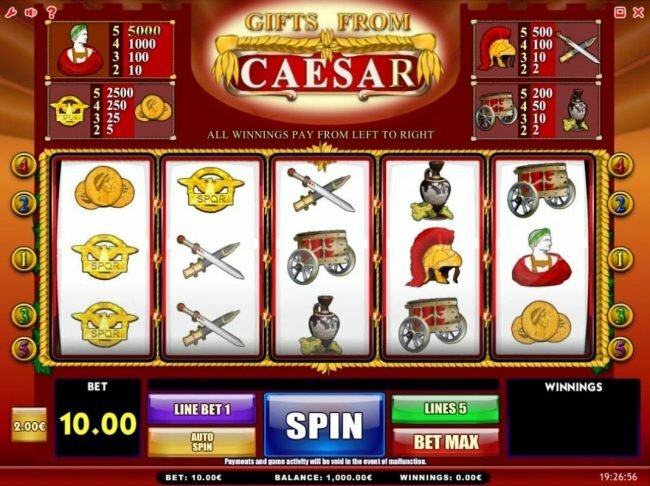 Gifts from Ceasar Slots has not been reviewed yet, be the first to rate this slot. It’s time to rule an entire empire in the 5 reel, 5 payline iSoftBet crafted video slot named Gifts from Caesar. This game doesn’t have any features that can be awarded. Instead, it only has high valued payouts. The highest payout is a jackpot prize worth $50,000.00. This games visual presentation is in a classic format, with the illustrations being set primarily on the reels. The background is only an orange/red hued wallpaper. The reels are at the bottom of the game screen, with the paytable taking the top position. Icons like golden coins, badges, swords, helmets, chariots, vases and Caesar himself will be showcased on the reels. Before this game may begin, you must choose how much to wager per spin. This starts at $0.01 to $2.00 per line, or a bet ranging $0.05 to $10.00. Then all that is needed is to click start. There are unfortunately no game features available to be won in this slot. Instead, there are only multiple payouts of a high valued nature. The golden coins & golden badges, for instance, can award $25,000.00 when the maximum bet is at play. Triggering the jackpot prize of $50,000.00 is done when five of the Caesar symbols are seen simultaneously. So even though there aren’t any features, there are still more than a dozen payouts available to be won at this slot. 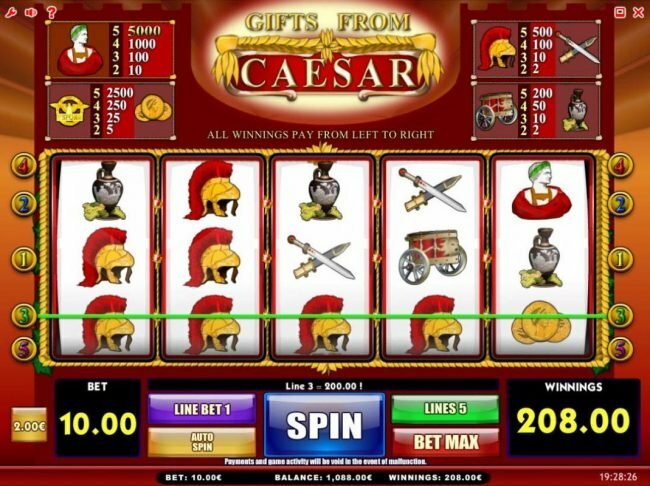 Gifts from Caesar, the game, presents players with the chance to win large sums of money through standard payouts. The lack of game features might cause for some not to be appealed by this game, but the lack of features make for fast-paced gameplay & for payouts to be won on a more annual basis. This results in the Slot still being fun for most.